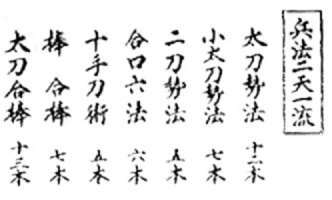 This hyoho (an alternative pronunciation of heiho, or strategy) was taught to me on Tuesday, May 20, 1997 in Guelph, Ontario, by Matsuo Haruna, chief instructor at the Musashi Dojo in Ohara, Okayama-ken. I was one of eight in this Hyoho Niten Ichi-ryu Kenjutsu class (Musashi's Daisho or two-sword school). In less than a day, Haruna-sensei ran through the standard twenty-four Kenjutsu Kata of NIR: twelve Itto/Tachi Seiho (Shitachi armed with Daito), seven Kodachi Seiho (Shitachi armed with Shoto), and five Nito Seiho (Shitachi armed with Daisho) -- Uchitachi is armed with Daito in all the Kata. Haruna-sensei also gave a brief talk on NIR, and we learned that NIR also has an almost equally strong Bojutsu component of twenty Kata, seven Kata of Bo vs. Bo, and thirteen Kata of Tachi vs. Bo. When carrying both swords, they are held together in the left hand, the daito is held most left by the pinkie and the shoto with the other fingers in such a way that the shoto tsuka points up more than the daito tsuka. The left arm is held straight down, the swords are brought to the hip only when something happens, like a bow for example or when you're about to draw the sword. When the shoto is inserted in the belt (which it is before starting the nito set), the daito tsuka is higher. To draw, the right hand grasps the daito, the left hand takes the shoto from below and both are drawn together so as not to cut a hand off. After finishing practice, the shoto is placed on the right of the daito in the right hand, the two are then transferred to the left as in the start. There are no chiburi or noto movements in this ryu. This part was explained by Kim Taylor. 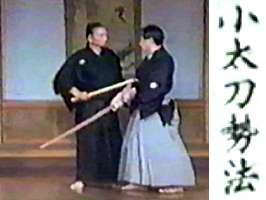 To bow for the itto set, take 3 steps toward the opponent starting right foot, with the sword at the hip, draw the daito, place the feet on line (shizentai) and go to sonkyo, both persons place their sword on the floor so that the points touch. The right fist is placed on the floor while the left hand is on the thigh (sumo style). The sword is picked up, chudan, then both take a neutral kamae, which is gedan for shidachi, and tate zen for uchidachi. Take 5 small steps back, left first. 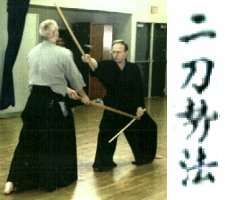 This is an old style bow, and usually a more simple form is used, that looks exactly like kendo no kata but with the feet together and flat on the floor: in chudan, take sonkyo and stand up again. Tate zen is a kamae where the sword is held pointing up, one fist in front of the belly, ha to the left, somewhat tilted to the right so as not to obscure the vision. The name compares it to the stick that is used in zen meditation. Gedan is with the sword in the right hand, the tip is in front of the right knee, ha turned somewhat to the outside, tip aims in front of the foot, not the center. Left hand is on the hip in kodachi gedan. Feet are together in both kamae, the right foot half a cm more forward. Sometimes the swords will be ready on the floor at the start, sometimes there is no bow. The ceremony at the end must be the same as at the start though. 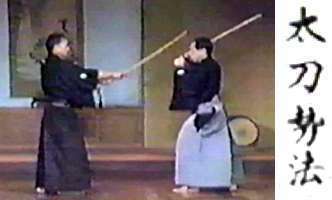 There are 12 daito techniques, uchidachi always starts in hasso: from tate zen the sword is brought to chudan, then to hasso. The feet don�t move. Hasso is 30 degrees up, with the left index at the corner of the mouth and the right index at the tip of the ear, elbows sticking out horizontally. Shidachi starts in different kamae, mostly gedan, sometimes hasso or waki. Wakigamae with the daito is taken as follows; from chudan, the sword is raised in jodan and the left foot is put forward. Then the right foot is drawn backwards and the sword is lowered to waki, the stance is very deep, with the knees pointing in the same direction as the feet. The right foot points to the right, not to the front, weight is evenly distributed over both feet. This stance is called koshimi. Another possible stance is moji gamae, short for Mojiri gamae. Left foot is forward in daito set, (right foot forward in the shoto set), the wrists are crossed, tip is aimed at uchidachi's throat. This is a slightly oblique chudan, and is taken by passing through jodan as in wakigamae. The footwork is somewhat fluid in general, according to Haruna sensei, "the book doesn't say anything about which foot". Sometimes an extra little step will be necessary to maintain correct distance. A detailed, illustrated manual on the three kenjutsu sets can be obtained from EJMAS.